A quality picture framing service from the simple to the ornate. 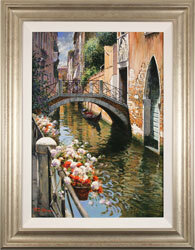 York Fine Arts has provided the greater Yorkshire area with a customised framing service for over forty years. With frames ranging from basic, essential frames for prints and photographs to ornate, swept frames for fine art, the gallery’s selection of hand-crafted frames is guaranteed to satisfy a range of individual framing needs. Picture framing is a precise trade, with each frame individually crafted to suit your specific requirements. As such, the gallery is unable to provide quotes over the phone; however, we will be happy to discuss your framing requirements and provide a customised quote in person at the gallery. Please note that our picture framing service is currently only available at our York gallery. For inspiration, read our article The Fine Art of Framing.